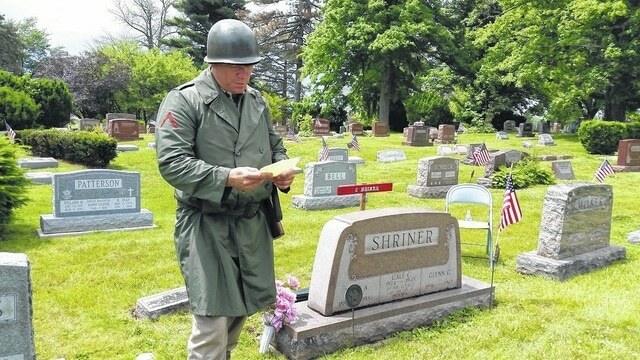 Rick Elwell reads a letter during his presentation of Gale Shriner during the Cemetery Walk Sunday afternoon at Fairview Cemetery. Six actors portraying notable Galion residents shared their stories Sunday afternoon during the cemetery walk which was held at Fairview Cemetery. The fourth annual event was presented by Galion Historical Society and the cemetery. An estimated 200 people attended the event, where actors stood by the gravestones of the deceased residents who made an impact in the area. Galion resident Rick Elwell played the role of Gale Shriner, who died in Okinawa during World War II while serving in the United States Marine Corps. The area native was 21 when he was killed. During his presentation, Elwell shared a letter Shriner wrote shortly before his death. In another part of the cemetery, Nancy Green said she was honored to play the role of her former theater director Miriam Sayre, who was a long-time Galion High School teacher and also served as a church organist. Other actors there included Melinda Nicholls, who portrayed Hazel Chase; Fred Smith, who portrayed Frank S. Wisterman; Cathy Moneysmith, who portrayed Bertha Coyle and Rich Henry, who portrayed Charles Wisler. In addition, a special presentation was held at the cemetery’s mausoleum.